What are Superheaters, Economisers and Air Preheaters? A superheater is a vital part of the a boiler system that is used to increase the overall efficiency of a thermal power plant. More specifically, it is a device which converts wet steam (saturated steam) into dry steam as dry steam contains more thermal energy. Dry steam is also less likely to condense within the engine cylinders or the casing of a steam turbine. Are there more than one type of Super Heater? There certainly is. In all, there are three types of Super Heaters: radiant superheaters, convection superheaters and separately fired superheaters. Depending on the size of the plant, they can vary from a few meters long to a few hundred meters. Aptly named, an economiser is a mechanical device that reduces energy consumption. It does this by acting as a heat exchanger, preheating the fluids that enter a boiler or recovering residual heat from the combustion products. It is designed to save energy by using the exhaust gases from the boiler to preheat the cold fluid, mainly water, that is used to fill it. An increase in fuel prices means that power plants are having to increase the boiler efficiency and this is made possible with the assistance of Economisers. As well as a boiler system, economisers cal also be found in heating, refrigeration, ventilation and air conditioning systems. Air Heaters are an important part of the heat exchange process. Similar to economisers, they are devices that transfer heat from one surface to another - but this time from fluid to air. The main objective is to increase the thermal efficiency of a boiler system by recovering the heat from the flue gas and using it to heat the air. Air heaters can be classified as tubular, recuperative or regenerative based on their operating principle. The first two are usually found in steam generators in thermal power stations. In the recuperative type, fluid (such as flue gas) is warmed through energy that is passed through a heat absorbing surface such as a metallic tube or plate. The captured heat is released into the cooler air and directed back into the boiler. Regenerative air preheaters are usually used for iron or glass manufacture. They capture and recycle about 60% of the heat energy exiting the boiler, which would otherwise be lost. What common Superheaters, Economisers and Air Preheaters issues can arise? Performance engineers acknowledge that superheaters, economisers and air preheaters are all vital to a plant’s thermal efficiency. When an issue arises with one of the devices, it can lead to detrimental effects to a site’s overall performance. Successful and reliable maintenance of steam generation equipment is therefore necessary to prevent issues from arising. The average life of a boiler is more than 30 years and well maintained superheaters, economisers and air preheaters should also last for a similar time. When failures do happen, it is important that the cause of the problem is correctly identified so that proper steps can be taken to prevent recurrence. Below is a list of what type of issues can arise. Material Buildup: Ash and particulate buildup can cause serious problems within superheaters. Without adequate and regular cleaning, the material buildup could create long term damage. Overheating: Almost all types of devices or tubes which carry water or steam and are exposed to high operating temperatures are susceptible to overheating. Long term overheating usually occurs in superheaters and reheaters as a result of deposits or restricted steam/water flow. Leakage: Malfunctions such as leaks immediately start decreasing a boiler’s efficiency and reliability. Properly sealing an air heater can reduce a plant’s heat rate by up to 75 kWh, increasing production and income as a result. Tube erosion: Boiler tube erosion caused by older cleaning methods can lead to unscheduled shutdowns and a lack of Power Generation. Fouling: Fouling of Economiser heat exchange surfaces is a constant problem (especially for power station engineers). It reduces boiler efficiency leading to lengthy downtime for cleaning which can be hard to plan and difficult to carry out safely. How to clean Super Heaters, Economisers and Air Preheaters? Acoustic Cleaners have been successfully introduced into these three areas to efficiently remove particulate matter, thus eliminating the need for other existing cleaning methods. In previous years, devices such as steam blowers, air blowers and tumbling shots were used - but as technology developed, they were proven to be rather ineffective in comparison to the modern methods. The use of this new technology in these three areas has now basically eliminated the need for any other cleaning methods. What are the benefits of Acoustic Cleaners? There are many benefits to using Acoustic Cleaners on your site. But firstly, here’s an explanation of how the technology works to solve issues within superheaters, economisers and air heaters. It’s quite simple really. Sound waves are transmitted into the devices and when they reach any ash or particulate build up, they cause the particles to resonate and dislodge from the inner walls. Gravity will then cause the buildup to fall away. An Acoustic Cleaner is activated by a timer and does not require a person to enter any vessel or device. It’s powered by compressed nitrogen (to avoid oxygen contaminating the product) to create the correct sound frequency. The timer is set to sound the Acoustic Cleaner for a few seconds at periodic intervals during either filling or discharging from the silo. The results are immediate, saving on both downtime and product loss. Coverage: As sound is used it removes particles from all around the heat exchange tubes rather than simply creating a path for airflow. The use of Acoustic Cleaners therefore leads to low differential pressures across superheaters and a larger temperature differential when compared with traditional cleaning methods. No tube erosion: Fluctuations of sound are used to remove particles rather than a blast of air or steam and as a result, problems of boiler tube erosion are removed. 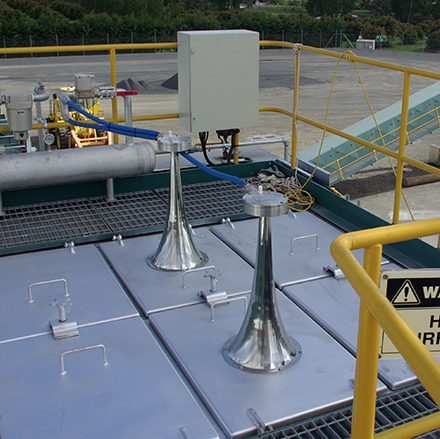 Primasonics offers a range of Acoustic Cleaners manufactured from Inconel for use in superheater sections. Non invasive: Very little modification of Superheaters is required to fit an acoustic cleaner. The Acoustic Cleaning technology is fitted through access points so very little modification is in fact required meaning that water jacket walls and refractory lining are not affected. No damage: As Acoustic Cleaners flood the areas with sound, buildup is removed at a steady and predictable rate without causing particle spikes at the filter. No damage is done to a device’s surfaces, the boiler tubes or refractory linings. Cost effective: Sound produced from Acoustic Cleaners is best employed between tube bubbles. Acoustic Cleaners can be mounted on access points and doors, making installation very quick and cost effective.